I am beginning to think that the CDIAC had the same sort of budget cuts that affected the EIA, and that this took down the server that I have been using. (Since it is still not available). 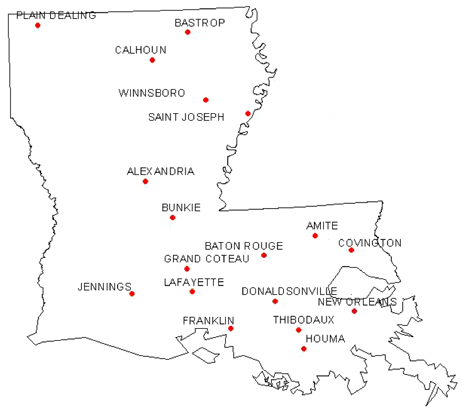 So to keep going with the foundation of the data base, until I can get the TOBS information into useful form, I am going to use the Surface Station USHCN site to get the preliminary data on the stations in Louisiana. I will then download the GISS information for the stations and proceed as I did for Arkansas. This at least will get the stations and populations established. 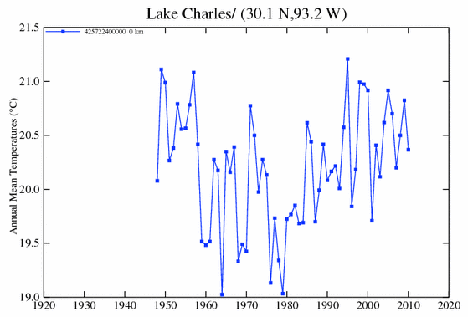 There are 18 USHCN stations in Louisiana, from Alexandria to Winnsboro, and there are two GISS stations, at Lake Charles and Shreveport, on the list. Looking for a source for the layout of the stations I find that I can get the Louisiana layout at the CO2 Science website. 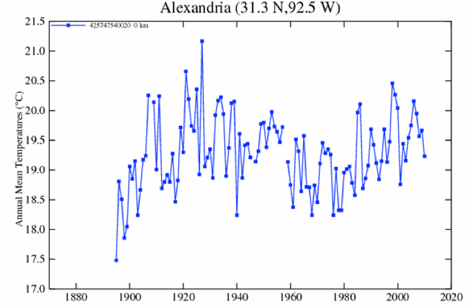 This site calculates a trend for the mean temperature data, but for the example I chose (Alexandria) it only goes up to 2006. This is an interesting resource in that it saves me calculating the trends for the different stations. 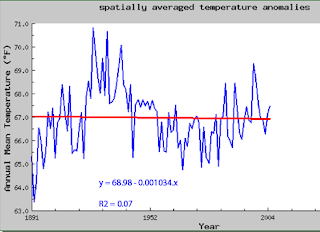 Since, at some time in the future, I had thought to move on from just the data to the trends, this will be a useful site to get that information. 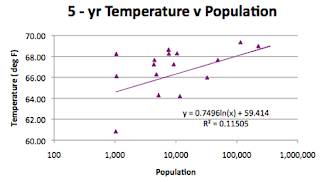 The question, however, is as to whether they are plotting the homogenized or raw data for the station? This is clearly not the same set of values, which means that there are two different homogenizations being carried out. 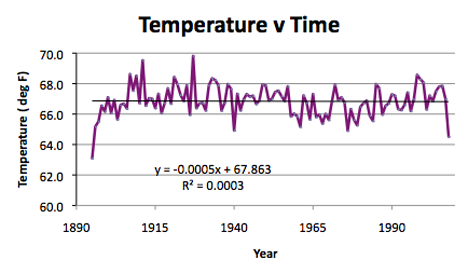 (Note that this is recognized at the top of the CO2 Science plot). So that gives another little puzzle to look into. However, for today, it is sufficient that I have found another site that shows where the USHCN stations are in the state, so that we can get a measure of how well they are distributed. So now I go to the GISS site (which again gives me some foreign location when I click on Louisiana) and pick Grand Coteau as being somewhere close to the middle of the state. 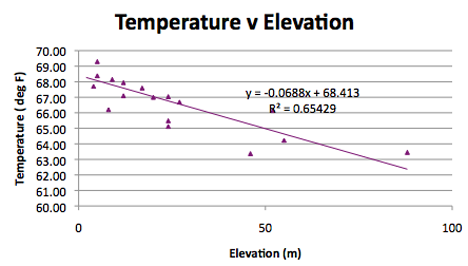 This allows me to find the rest of the sites in the state, using the (*) facility to locate adjacent stations. 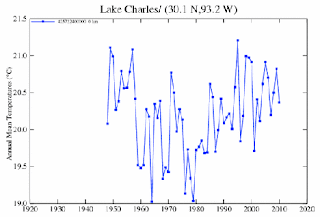 So first I download and convert the data, and discover that the GISS station at Lake Charles has only been in operation since 1948, which no longer comes as a surprise. 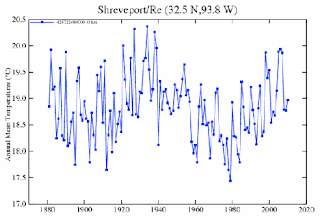 On the other hand Shreveport has been reporting data since the 1880’s. 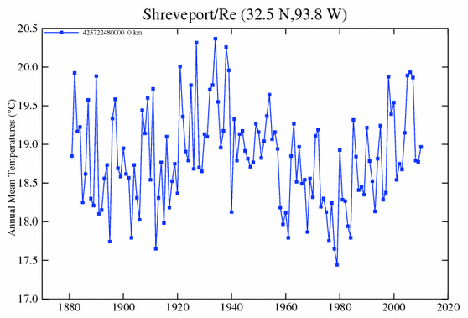 And, in passing we note that Louisiana was warmer in the 1930’s than recently. 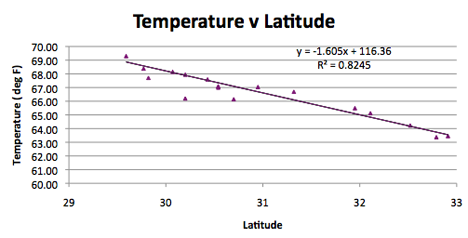 So what does the data look like (bearing in mind that I am only working with the homogenized data at the moment) ? 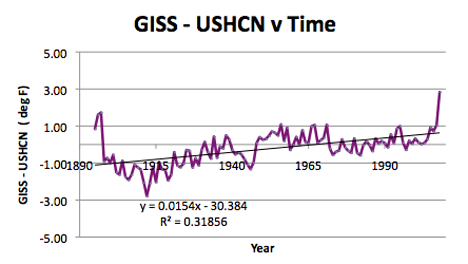 Difference between the average GISS station temperature and that of the average USHCN stations in Louisiana, over the past 115 years. 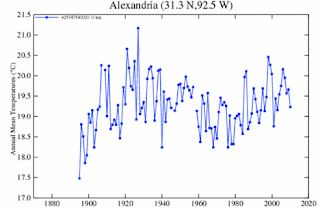 Over the past 115 years the average state temperature has followed the pattern shown above for Alexandria, although the rate of temperature decrease is at a rate of around 0.05 degrees F per hundred years, which is sensibly saying that it has stayed the same. It is interesting that the visceral reaction of those who disagree is to suggest that this sample is too small, and thus meaningless – yet it is consistent with other states, and cumulatively these numbers start to gain importance. Looking at the geographic information for Louisiana, it is a state that is 380 miles long and 180 miles wide. It runs from 89 deg W to 94 deg W, and from 29 deg N to 33 deg N. The center of the state is thus at 92.5 deg W and 31 deg N approx. 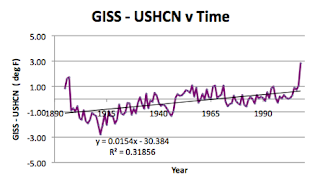 The USHCN stations center on 91.6 deg W, 30.9 deg N. The GISS average is 93.5 deg W and 31.3 deg N. The average elevation of Louisiana is 30 m above sea-level, with the USHCN being at 24.4 m, and the GISS average being at 35.5 m. The highest point in the state is at 163 m.
So looking at how the temperatures are controlled by the geography, the correlation with Latitude is as expected. 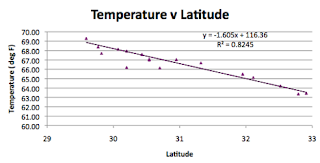 And while there is a suggestion that the decline with change in longitude is significant, because of the changes in other states, I continue to consider that it, in reality, dependent to other factors. 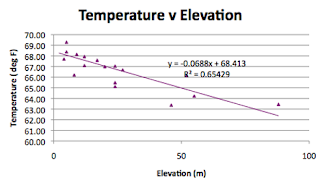 The most likely is that of elevation, and, despite the relatively low-lying nature of the state, the correlation with elevation remains strong. In regard to the population figures of the state, there was only Calhoun where I had to go to zip-codes to get a number. The rest had populations through the citi-data sites. 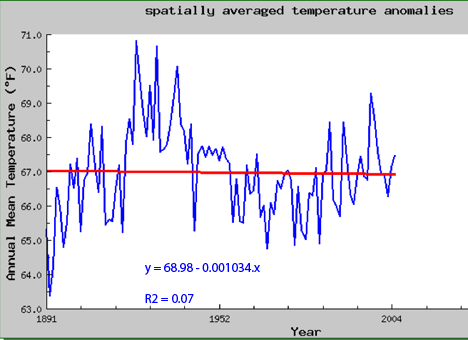 And I decided, for now, to use the 5-year averages – by fixing on this before looking at future data it seems a little better than to look for a “best fit” each time. And my apologies that these are running a little late – apart from some personal time demands, I took time this week to download all the state maps of the stations so that I will have those available for the rest of this initial series.